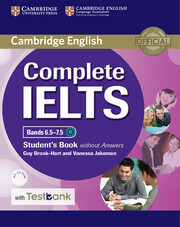 The Student's Book without answers contains 8 topic-based units with stimulating speaking activities, a language reference, grammar and vocabulary explanations and examples, to ensure that students gain skills practice for each of the four papers of the IELTS test. The CD-ROM contains additional skills, grammar, vocabulary and listening exercises. 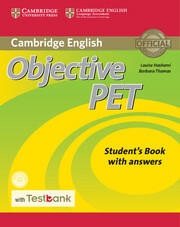 A Testbank access code for four online IELTS Academic practice tests is inside this book (class-code from teacher required). Class Audio CDs, containing the recordings for the listening exercises, are available packaged separately or as part of the Student's Book Pack.